1. Guide Number for Power Output 2. So how powerful does it need to be? 3. Close-ups with a powerful flash? 4. What do I need in order to get creative? 5. Tilt and Swivel 6. Why do I need swivel? 7. What Else do I need to look for? 8. Anything Else? Although all cameras these days come with a built in flash, they are mostly rather small things with fairly low output. They will get you out of trouble, when the light level is too low but, when you want to do some real indoor or night photography, you would be better off with a separate flash gun. Flashguns come in all shapes and sizes (and prices), so how do you choose the most suitable one for your needs. Well, the first thing to find out is the power output of the unit, how much light it will kick out, for this you need to know the guide number. The guide number is so called because, in the old days of manual camera settings, it was used to calculate which aperture setting to use. You would measure the distance from subject to camera and, using a simple formula, work out the correct aperture to use. You can still do that of course, but nowadays we don't have to do the math anymore because the camera and flashgun will do the sums for us. Also it's a bit more complicated because nowadays flashguns don't just kick out the same amount of light each time, they adjust the amount of light output by reading the light reflected back from your subject and shutting down when enough has been delivered. An amazing trick to perform in such a short space of time, sometimes as little as 1/30,000th of a second! So the guide number is now quoted as the maximum guide number and, although you don't need to bother with it any more when you are setting up your camera, it is still a good way to compare one flashgun with another. The higher the guide number (usually quoted at 100 ISO, make sure you are comparing like for like), the more powerful the flashgun. Just to make things even more complicated, sometimes you will see different guide numbers for different focal lengths, so as you zoom, the guide number changes. Once again, make sure you are comparing like for like. So to compare two guide numbers, make sure they are quoted at the same focal length and the same ISO setting. If you would like to know more about the maths involved here's an article on Wikipedia. So how powerful does it need to be? Well, you already have a small flashgun built into your camera so, in my opinion, there's no point in buying a small gun, so buy the most powerful gun you can a) afford and b) be bothered to carry around. There's no point in buying a great big flashgun if you don't have it with you when you need it. Will I still be able to do close-ups with a powerful flash? Yes, as I said earlier, the flash will adjust the light output if your subject is closer than the maximum distance. Although there is such a thing as too close, most flashguns will have a minimum distance in the instructions, usually between three and six feet (one to two meters). What do I need in order to get creative? Having a separate flashgun is not really about having extra power, although that's nice, it's about being able to control the light better. On-camera flash is all very well, but it gives a rather stark light, it's like shining a torch into someone's face, not very flattering. A good flash will allow you to tilt the head upwards so you can bounce the light off the ceiling, lighting your subject from above. This looks very natural as it is how we normally see people lit, from above, either by a light on the ceiling or by the sun. Also it spreads the light out (diffuses it), which produces a softer light, much more flattering for portraits. A harsh, point source, of light tends to highlight every blemish, whereas a softer, more diffuse light, smooths the skin out a little. Spreading the light out in this way also enables us to see the rest of the room better, very often a person lit by direct flash will appear to be standing in the dark because the light is not reaching the background in sufficient quantity (see inverse square law). OK but why do I need swivel? I thought you'd never ask. When taking a portrait of a single person, in order to fill the frame better, you should usually turn you camera on it's side and compose the picture in an upright frame. If you do this, you will need to swivel and tilt the flash in order to point it at the ceiling. Also it's nice sometimes to bounce the light off a wall to get a side-lit effect. Sometimes I find the best effect can be achieved by pointing the flash up and to the side, aiming for both the wall and the ceiling. With a flashgun that tilts and swivels you can direct the light almost anywhere. What Else do I need to look for? Most decent modern flashguns will offer TTL (through the lens) metering which, as I mentioned before, works during the exposure, unlike the normal, continuous light meter which measures the light before you take the picture. To perform this very clever feat, you need a flashgun which is matched to your particular camera. However, as with lenses, this doesn't mean you are restricted to buying only the manufacturer's own flashguns, there are plenty of independent makers, such as Metz , that have flashguns which are made to perform with all the popular makes of camera. Just make sure that you get the right model, the one that is made for your camera. You can still set the flash and camera to manual and do all the work yourself if you want to, but I find, in practice, that I never do. The auto setup is pretty good and, for those occasions when it is fooled, there is an override button where you can over or under expose a little. Some flashguns come with other features and bolt-on goodies, like a fill-in flash. 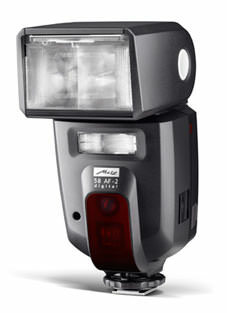 This is a second, smaller flash that always points to the subject to partially fill-in any shadows you have created. Some come with diffusers built in and a selection of colored filters to put over the light. I find most of these extras are of limited use in the real world and are there more to sell the flashgun than to help the photographer, the fill-in flash might be mildly useful. One useful feature to watch out for is a zoom head, which basically focuses the beam of light as you zoom your lens so that more light is delivered to your subject at long focal lengths, but it will still cover the whole picture area when shooting wide angle. Having a separate flashgun with tilt and swivel can really enhance your creative choices when shooting pictures in low light, and free you from the tyranny of the built-in flash. A short introduction to the types of cameras available and a discussion on what you need to look out for when buying a camera. What you need to know when choosing a new lens. Confused comparing 35mm lens focal lengths to the new DSLRs? This will make it all clear. What you need to know before you go shopping. More of a 'why you need a tripod' than a buyers guide, but it does include some tips on buying and using a tripod.